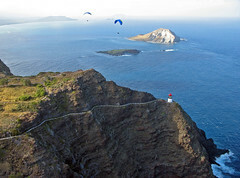 After scratching and struggling in weak thermals the day before, we were lured out to Makapuu once again by the clear skies yesterday in hopes of a long awaited XC flight. Maybe the high pressure would abate so we could core some thermals and fly downrange. But our hopes deceived us: the thermals were once again sparse and weak. The high pressure is keeping the air a bit too calm for our liking. At least there was more ridge lift today. Don and Mad Dog and Marathon frolicked around Cactus with touch-and-go approaches and top-landings. The conditions were perfect for it - medium strength and straight in. After a while the sea breeze turned way east, and a bunch of us managed to soar the lighthouse ridge up and down for hours. It was my first time doing that - it's kind of spooky because there's nowhere to land if you get low. But yesterday the lift was huge over there and I never worried about getting low. From my high vantage point I watched Marathon Mark down low buzzing the lighthouse over and over like a moth around a flame. But thankfully he managed not to get burned. Russell tried numerous approaches to join us while we were over there, but when it's that east it can be challenging. I remember many days when I was the only one who couldn't figure out how to penetrate the headwind to get over there. Keep working on it Russell - I know you can make it work. Sometimes it helps to go with a pack so you can see which approach is most efficient. We also had visitor Pierre from Florida (and originally Utah) out there, and Alan from Indiana. I took more than 80 photos but I pared them down to a more reasonable 15 for uploading to Flickr. I can't wait to get back over to that ridge and take some more. Maybe next time I'll launch over there!